Names for national legislatures include " parliament", " congress", " diet", and " assembly", depending on country. Legislatures are made up of individual members, known as legislators, who vote on proposed laws. A legislature usually contains a fixed number of legislators; because legislatures usually meet in a specific room filled with seats for the legislators, this is often described as the number of "seats" it contains. 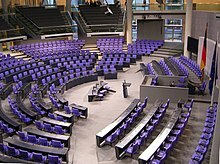 For example, a legislature that has 100 "seats" has 100 members. By extension, an electoral district that elects a single legislator can also be described as a "seat", as, for, example, in the phrases " safe seat" and " marginal seat". ^ Schoenbrod, David (2008). "Delegation". In Hamowy, Ronald. The Encyclopedia of Libertarianism. Thousand Oaks, CA: SAGE; Cato Institute. pp. 117–18. doi: 10.4135/9781412965811.n74. ISBN 978-1-4129-6580-4. LCCN 2008009151. OCLC 750831024. Garner, James Wilford (1905). "Legislature" . In Gilman, D. C.; Peck, H. T.; Colby, F. M. New International Encyclopedia (1st ed.). New York: Dodd, Mead.